Pollinating animals and their angiosperm hosts often show strong co-adaptation in traits that increase the likelihood of a successful transfer of pollen and nutrient rewards. One such adaptation is the reported colour difference caused by unequal distribution of anthocyanidin pigments amongst plant species visited by hummingbirds and passerines. This phenomenon has been suggested to reflect possible differences in the colour vision of these pollinating birds. The presence of any such difference in colour vision would arguably affect the ecological and evolutionary interactions between flowers and their visitors, accentuating differences in floral displays and attractiveness of plants to the favoured avian pollinators. 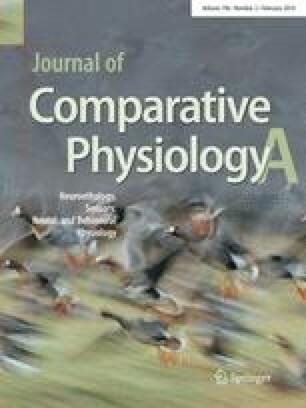 We have tested for differences in colour vision, as indicated by the amino acid present at certain key positions in the short-wavelength-sensitive type 1 (SWS1) visual pigment opsin, between the major groups of pollinating birds: the non-passerine Trochilidae (hummingbirds), the passerine Meliphagidae (honeyeaters) and Nectariniidae (sunbirds) plus five other Passerida passerine families. The results reveal gross spectral sensitivity differences between hummingbirds and honeyeaters, on the one hand, and the Passerida species, on the other. The sequences presented in this study are available at GenBank with acc nos: GQ305950, GQ305951, GQ305954–GQ305968. Australian Museum, Sydney, Burke Museum, University of Washington, Seattle, the Field Museum, Chicago and the Swedish Museum of Natural History, Stockholm, kindly provided the tissue samples. We would like to thank Julian Partridge, Jon Ågren and the two anonymous reviewers for constructive comments on earlier versions of the manuscript. This study was financially supported by the Swedish Research Council FORMAS to AÖ, the Swedish Research Council (VR) to OH, and by Stiftelsen för Zoologisk Forskning and the Royal Swedish Academy of Sciences (sequencing). It complies with the “Principles of animal care”, publication No. 86-23, revised 1985, of the National Institute of Health, and also with current Swedish laws.